Tampa, FL – The Florida Aquarium officially opened its $4.1 million Sea Turtle Rehabilitation Center in Apollo Beach today. The two story, 19,000-square-foot center features five different rehabilitation pools including one of the state’s deepest turtle-exclusive dive pool with observation window. The pools at the new care center range in size from 1,500 to 25,000-gallons. The sea turtle dive pool, which reaches a depth of 11-feet, will be used to assess buoyancy issues, swim conditioning and food trials before turtles are cleared by FWC to be returned back into the wild. The center also includes a state-of-the-art sea turtle surgery suite. “We believe we have a responsibility to be good stewards of our environment and the animals that depend on it, and this investment will only help us further our mission of protecting and restoring our fragile Blue Planet,” Germann added. The Sea Turtle Rehabilitation Center was made possible through a unique public-private partnership consisting of groups who all shared the same common goal of working to achieve and maintain healthy sea turtle populations. The Florida Fish and Wildlife Conservation Commission (FWC), contributed $3 million, The Spurlino Foundation and others donated $690,000, The Florida Aquarium contributed more than $400,000 and TECO Energy helped make the center a reality through a generous land use agreement. The Florida Aquarium’s Animal Response Team, that manages sea turtle rescue, rehabilitation and release efforts, has recently been expanded, thanks to a $250,000 grant from Florida Blue. Since opening its door, The Florida Aquarium has helped rescue and rehab more than 150 threatened or endangered turtles. The Sea Turtle Rehabilitation Center will only ensure that number grows. Roughly 90% of all sea turtle nesting in the United States takes place on Florida’s beaches. There are seven different species of sea turtles including Flatback, Green, Hawksbill, Kemp’s Ridley, Leatherback, Loggerhead and Olive Ridley. Of the six sea turtle species found in U.S. waters or that nest on U.S. Beaches, all are designated as either threatened or endangered. Some sea turtles can live up to 50-years or longer. Leatherback sea turtles can travel more than 10,000 miles every year. Green sea turtles can stay underwater for up to five hours. The Florida Aquarium is a 501(c)(3) nonprofit institution whose mission is to entertain, educate andinspire stewardship about our natural environment. It has been voted a Top 3 Aquarium in North America by the readers of USA Today (May 2018), it’s earned a Trip Advisor Hall of Fame Rating (2018). 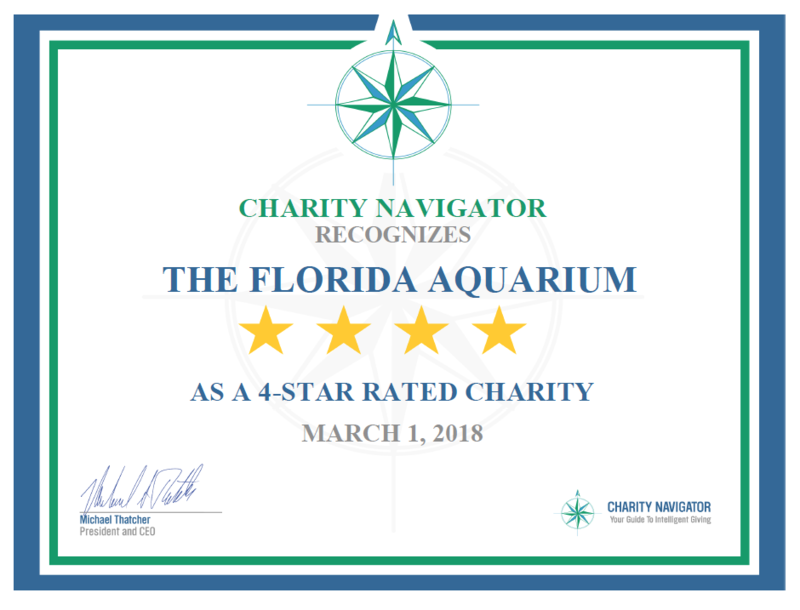 The Florida Aquarium has also earned a 4-Star rating from Charity Navigator and been awarded a platinum rating from GuideStar.